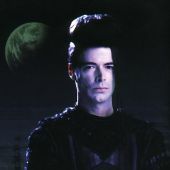 Lexx Links and Downloads - Downloads, Links and Chat - The Squawker - You have arrived in the LEXXVERSE where the spirit of Lexx lives on. it's the best in the business baby! you'll find no finer out there! yeah..LexxVerse Rocks your Universe! Though originally made for the free NASA Space Similator program CELESTIA, the 8 megabyte model is in "3DS" 3D Studio format, which can be viewed, flown, or edited in most 3D programs, the "3DS" format being very universal. 3Ds Max is used by Sims 2 modelers in making new meshes. Anyone want to drive Lexx to work? Oh and what are you working on now missy thang? And when will we get to see it? But IF this turns out the way I wanted it to.....it will be a BLAST, be sure of it! The results will show up, hmmm, I can´t tell you exactly but I hope it will be this year. It takes a lot of time and work....and "only the best" for you all, so gimme a bit time! Hehehe, okay okay. Now you've got me more CURIOUS than ever. I hope it all works out as planned! See LEXX eat Holland on Google Earth in living 3D! A user ("Paul H. Manning" has uploaded a LEXX folder at GOOGLE WAREHOUSE. or you can just go to http://sketchup.google.com/3dwarehouse/ and type "LEXX" in the search for models since his collection folder is also named "LEXX". Anyways - thought I'd post that LEXX has now made it to Google Earth, and saving 1 copy of each of the 11 sketchup files comes to over 30 megabytes, hopefully large enough for Lexxians appetites (for now). Also you can rate the models and post opinions. Kewl find XS4Xevr! Hopefully I can view it better when I get my puter back next week, my CRT from work makes everything look dark. I found another good site with a lot of pictures taken out of all the 4 seasons.